One of my favourite Rioja producers is Marques de Murrieta, which happens to be one of the oldest and most famous estates. It can actually claim to be older than Rioja itself, as Murrieta was established in 1852, and the Denominacion d’Origen (D.O.) was created in 1925! Lucian Murrieta was of South American decent. He bought the Ygay estate, at the southern tip of Rioja Alta in 1837. Visiting London in the 1840s, he was surprised that Rioja didn’t appear alongside Bordeaux, port and sherry wines. He set about improving the quality, which included frequent trips to Bordeaux, borrowing Bordeaux techniques such as blending and ageing in small oak barrels. It wasn’t long before Murrieta wines were awarded medals and Diplomas reflecting their premium quality. He was honoured with the title of ‘Marques’ by the King of Spain, in recognition of his services to Rioja wine. And Marques de Murrieta makes truly great wines. Their most recent illustrious release is a Château d’Ygay 1986 white wine, made from old Viura vines in the Capellania plot, and aged for 30 years in barrels, cement vats, and finally, in bottle. It’s the best of the best. In the long history of the winery, they have only made thirteen vintages of this wine. The famous American critic, Robert Parker gave this wine a perfect 100/100 score. It’s a multi-faceted gem; tasting it is a unique experience. Deepest gold. Toffee, caramel, with honey, dried figs on the nose. The palate is intense, powerful, viscous, layered and very long. Oxidative, but with fresh vibrant acidity, dried apricot, honey, glace fruit, lanolin, griddled nuts. The price? Around €400 per bottle. In reds, the estate only produces red wines from Reserva level and above. The latest Marques de Murrieta Reserva (2012) includes 77% Tempranillo, 10% Garnacha, 8% Graciano and 5% Mazuelo, Each component is aged separately in 225 litre American oak barrels for 23 months, including 9 months in new oak. Only then is it blended, where it is allowed to marry and develop further for a full year before being released. It is a powerful wine, with amazing balsamic notes, and very rich fruit intensity. It is perfect with red meat, but equally good with robust white fish, like hake. The very best component wines are set aside in the winery for extended ageing and are destined to become Gran Reserva. The latest release (2009) has 89% Tempranillo, 5% Mazuelo, 4% Graciano and 2% Garnacha. It sees a similar oak regime, but with 3 years bottle ageing after blending. It shows wonderful toastiness, with incredibly rich dried fruit, bramble and balsamic notes. I regularly show Reserva at wine tastings and my wine courses, and they always deliver a ‘wow’ factor. I have no hesitation in buying these wines, especially from a good vintage, as I know they will keep improving for several years. I was thrilled to find some magnums of the excellent 2010 vintage in O’Brien’s, and promptly bought the lot! For something very special, Dalmau is almost unique in that it includes about 15% Cabernet Sauvignon in the blend. Murrieta is one of very few wineries in Rioja which is permitted to use Cabernet Sauvignon as part of their blend. This 15% goes a long way in adding extra colour, tannin, acidity and fruit to the wine. Only 3-4 vintages are produces each decade, and the latest release (2012) was of 24,000 bottles. The grapes come from the Canajas vineyard, a rocky plot with 90 year old vines, where the yield is less than a third of the permitted maximum. Alongside Cabernet, 70% Tempranillo and 15% Graciano (adding acidity) make up the blend. The wine is deep ruby, with intense cassis and toast aromas, very powerful, broad-shouldered, with firm tannin, but well-met with ripe fruit. Equally special is Castillo Ygay Gran Reserva Especial. To date, only 51 vintages have ever been made. Grapes are sourced from vines dating back to the 1950s, at La Plana, at the highest point (485m alt) in the Finca Ygay. The key, according to Maria Vargas, is the skin, and the fermentation takes place slowly to extract maximum flavours. The 2007 vintage is 86% Tempranillo (matured in American oak), and 14% Mazuelo (French oak), for 28 months, resting in concrete before and after blending. The wine is allowed to mature in bottle for 3 years. Ygay 2007 has huge aromas – damsons and plums initially, then dried fruits and balsamic. Incredible fruit levels, with truffle/earth undertones; extremely firm, vibrant, long. This is a wine to set aside for a special occasion. 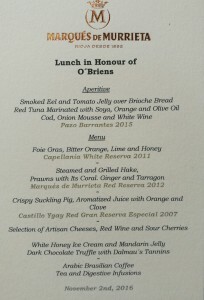 Visit and tasting courtesy of O’Brien’s, who are the importers of this wine in Ireland.